River Valley freshman Will Hash locks in a hold during a match at the Skyline Bowling Wrestling Invitational held on Dec. 29, 2018, at Gallia Academy High School in Centenary, Ohio. 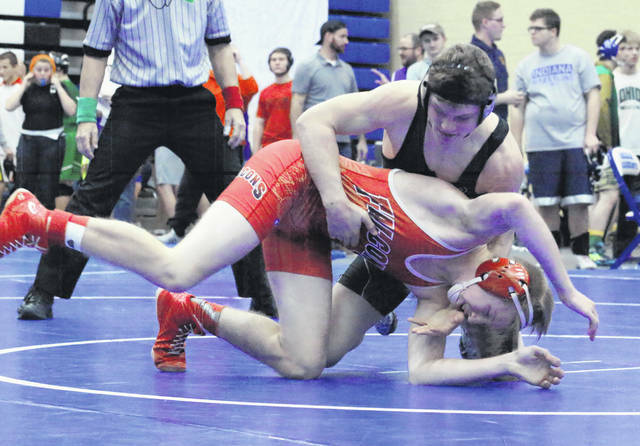 NEW LEXINGTON, Ohio — The River Valley wrestling program came away with a quartet of top-eight placers and 10th place finish on Saturday at the 2019 Jimmy Wood Invitational hosted by New Lexington High School in Perry County. The Raiders finished in the top half of the 23-team field after posting a team score of 113.5 points. The Silver and Black also came away with a placer in the fourth, fifth, sixth and seventh spots. Lancaster won the annual event with a score of 255.5 points, with New Lexington (209.5), Barnesville (193) and Fairfield Union (183) rounding out the two through four positions. Nathan Cadle led RVHS with a fourth place effort at 138 pounds. Cadle went 3-2 overall, which included two pinfalls and a technical fall. Will Hash was fifth at 145 pounds with a 4-1 mark that included a pinfall and a pair of technical falls. Eric Weber placed sixth at 182 pounds with two pinfall wins and a 2-2 record. Joseph Burns was seventh at 120 pounds with three pinfalls and a 3-2 mark. Lancaster led the tournament with three individual champions, followed by Newcomerstown and Barnesville with two apiece. Northridge, Granville, Fairfield Union, Athens, New Lexington, Martins Ferry and Columbus DeSales also came away with a weight class title each. Visit baumspage.com for complete results of the 2019 Jimmy Wood Invitational held Saturday at New Lexington High School.